I love potatoes and if you’ve tried my twice-baked potatoes loaded with delicious flavours you must try these herbed sliced baked potatoes. These sliced baked potatoes make the perfect vegetarian or meatless side-dish to any meal. In the Don household I have been busy getting the kids back to school stuff sorted and ready for my family. I know it’s early but this is when all the great sales are on and I can bulk buy for the next year or so. Yes, I said year! Who wants to miss out on getting books and crayons for 25c and 10c a pack? We are also busy painting the deck which we have put off for the last year. We finally decided that if it’s not done now we will need to replace the deck at a much heftier cost to our budget. After looking around we decided on one from Home Depot which was on sale and had a rebate on it. Bonus! The best part of the herbed sliced baked potatoes is the time it takes to prepare them. Being a mom I don’t always have lots of time to create fancy meals in the kitchen so simple and quick meals work for our family. I always like quick recipes that can go with main dishes and this is one of my go to quick dinner side dishes that is done in 25mins. Yes that’s all it takes to have delicious oven baked potatoes. When we go grocery shopping I take a look at how many people are buying those deep-fried potato wedges and pay $6.00 for a large box and shake my head. 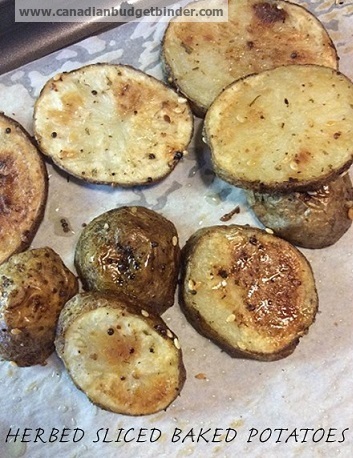 It really takes no time at all to make a healthier version of oven baked potatoes at home. The best part is the most you pay for a bag of potatoes is $3.99-$4.99 and if you’re lucky and they are on sale 10lbs of potatoes will run you about $1.88. Can you see the savings by eating at home? Convenience does cost our wallet so it’s important for me to make the time to buy the ingredients I need to make meals at home for my family so we can use the money-savings for other fun family excursions. If you want to make oven baked potato chips you can cut the slices even thinner but make sure to watch them carefully so they don’t burn and turn them over one by one. I know it sounds tedious and it is but it will be worth it in the end. I’ve even made oven baked sweet potatoes instead of regular potatoes for this recipe but tend to cook them a bit longer. In my opinion I’ve perfected my sliced baked potatoes but you will have to be the judge of that. If you think it’s one of the best potato recipes then add it to your recipe box and enjoy. If you love potatoes you will enjoy this meatless meal of baked sliced potatoes which is the perfect side-dish for any meal. That’s it, a simple side dish that will pair up nicely with any meal. Why not mix it up and put some paprika in there or a little hot sauce to have with those BBQ wings and garden salad or simply just add salt and pepper it’s up to you! Potatoes are kind of my weakness; I love them in a whole bunch of different ways so I’ll definitely have to try these. Thank you for sharing! I used to grab the crayons and such on sale too but I would get extras for those Christmas stockings as well!!! The best prices are at back to,school sales so why not stock up as much as we can!!!! I’ll be looking things over for the grandson’s birthday in September (he will be 5 yrs old!! !where did that time go!!!!) as well as for Christmas for him!! !